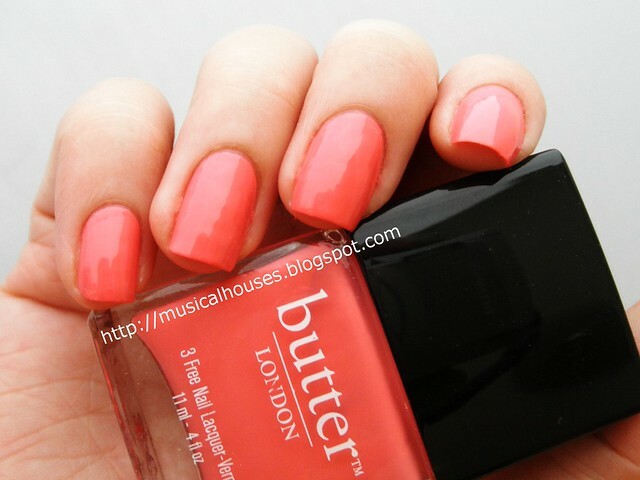 Butter London Trout Pout: Pinky-Coral and Springy! Butter London is one of the brands I've become enamoured with lately - despite their hit-and-miss quality, as well as their high prices, there's just something about those cute rectangular bottles, with their pretty colours and cheeky names, that makes me just want a few more shades. 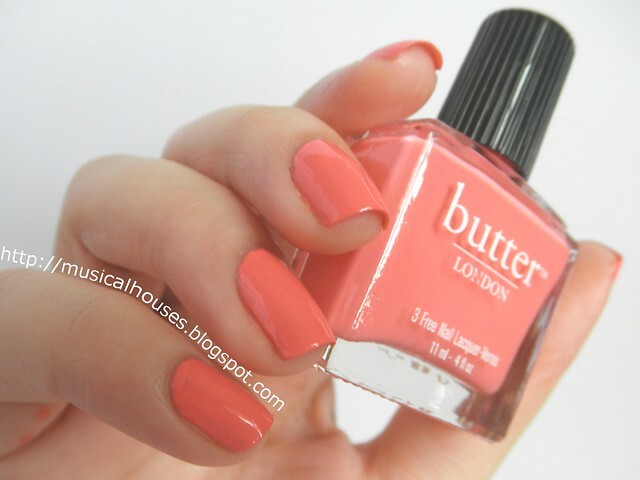 And so here is one of my latest Butter London acquisitions, which I think is perfect for whatever warmer Spring weather is coming up - Trout Pout! I happen to be wildly in love with this colour at the moment - it is so perfect for the season, as we look at all the Spring-themed collections and products the various brands are putting out. Just look at that gorgeous colour! Butter Londons can be pretty spotty when it comes to quality - some of them are gorgeous two-coaters, some of them are four-coats-and-there's-still-VNL kind of colours, but fortunately Trout Pout is one of the good ones! What you see here is two coats, in natural shaded daylight. Good application, pretty colour, and only one or two small bald patches, due to my impatient application. This polish lasted for about 4-5 days on me before any significant chips appeared, which is pretty usual for me. I love this polish - the combination of colour, fairly smooth application, and the compliments it got me (not necessary, but always a bonus) means I'll be wearing this again! The Bottom Line: Unique colour, great application, and good quality make this a keeper for me. So many beautiful colors that I can use, but If I use them on my nails it can be so bad, can't it? Now that I think about it I feel so relieved! I will use bronze, military green, brown!!!! and all orange ,peach, corals! !, warm greens and golden! !